Hi, I am interested in your 1928 Ford Model A (stock #18GKM53) listed on Autotrader for $149,900. I'd like to get more information about this vehicle and confirm its availability. Beautiful Hot Rod - Amazing amount of work in this Ford - All Steel body - Tan Leather interior - 355ci V8/700R Transmission - Power Steering - 4 wheel power disc brakes - Air Conditioning and Heat - (Please note: If you happen to be viewing this vehicle on a website other than our main website, its possible that only some of our many photographs of this car are presented due to website limitations. To be sure you access all the photographs, please go to our main website: Garage Kept Motors.) This is the epitome of the Built not Bought hot rod. This 1928 Ford Sedan was acquired in 2006 by the owner of a local automotive shop. In the past 12 years, hundreds of thousands of dollars were invested in a no-expense spared effort to build the most pristine replica of the companys logo. The money poured into this build is outstanding, which doesnt even include endless hours of our clients time. Since completion this spring, it has been used as a show car only and received top marks at Autorama 2018. It is now an all steel body; all fiberglass was replaced with metal. 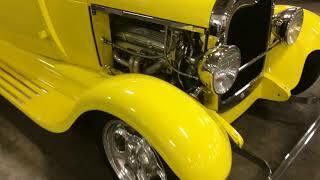 The car was then professionally finished in Yellow over a tan leather interior. It is powered by a 355ci/375hp small block Chevy V8 with a 700R Coan Transmission. It has Hilborn Injection System, 9-Inch Ford differential, 4-Wheel Disc Brakes, AC/Heat System, Power Steering, and Power Brakes. Every nut and bolt was professionally fitted. To give you an idea of how expensive this build was, it has two custom side gas tanks and each of them cost $5k. You wont find another 28 Ford this dialed in with a open pocket-book for assembly. Call if interested or e-mail with any questions. Thank you for looking.